When it comes to reality-based self-defense, repetition, as practiced by most martial arts schools, could cost you your life. 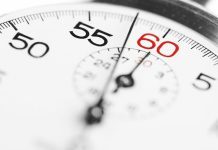 You’ve heard it said, “Practice makes perfect.” A more accurate proverb that martial artists should live by is, “Perfect practice makes perfect.” The problem with most martial arts training is that the training is not always perfect. When it comes to reality-based self-defense, repetition, as practiced by most martial arts schools, could cost you your life. Let me tell you a true story that was told to me while I was training the defensive tactics instructors of the Poliisikulu (the National Police Academy of Finland) in Tampere in 2002. A Finnish police constable (a “constable” is equivalent to a police officer in the United States) was confronted by a violent criminal. The criminal pulled a gun and pointed and the constable’s in order to take his life. The constable immediately disarmed the criminal and pried the gun from his hand. The constable then gave the gun back to the suspect without thinking. Realizing the mistake he had made the constable had to do a second gun disarm, and just in time. The Finnish constable was successful in with the second gun disarm, and criminal was arrested and went to jail. So, why did the constable give the suspect’s weapon back to after disarming him? The answer is obvious. In his martial arts training he always handed the training gun back to his training partner after completing a gun disarm. He had conditioned himself through repletion to give the gun back after every disarm. When I first heard this story in Finland I thought that it was an isolated incident, but when I was describing this same event to other Defensive Tactics instructors around the world they uncomfortably confessed that they had received similar reports of mistakes made out in the field because of training methods practiced in the police academy or at duty stations. The Finnish police instructors at the academy were so alarmed by the officer’s actions that they made a new academy rule forbidding any constable who is performing the gun disarm to give the training weapon back to the attacker (the person playing the role of the suspect). Consider your own training. How many bad habits do you condition yourself to do? If real conflict is not part of your “reality,” bad habits are easy to form. If you are a tournament point fighter, for example, are you going to make the mistake of hitting a suspect once and then backing off because you were conditioned that way? If you are a MMA fighter, and you’re on the ground underneath a genuine bad guy, are you going to make the mistake of punching or trying to do a submission hold when you should be launching deadly force techniques? 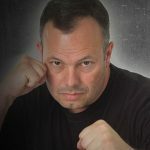 The way I teach my Reality-Based Personal Protection students to properly condition themselves for real conflict, and which you may want to incorporate into your own training, is to always have three elements present in the technique train: 1. A realistic starting point 2. Reality-based techniques 3. A realistic stopping point. A realistic starting point is nothing more than doing a realistic scenario. 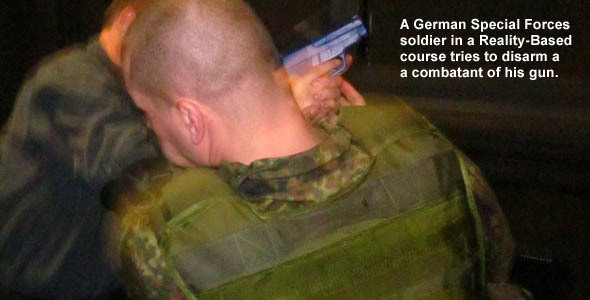 Rather than just have a training partner point a rubber or plastic training gun at you at point black range, pretend that you are at a money machine and your training partner, who is playing the criminal, comes up to you wearing a jacket and suddenly pulls a training gun from his waistband. In such scenarios you might even be able to control the weapon before it is completely deployed or you might want to start running as the weapon is coming out. Reality-based techniques are just that techniques that are designed to work against today’s criminals and terrorists. If you think you can control a gun with one hand and punch the crook in the face simultaneously with the other hand, or do some fancy wrist twist and strip the weapon clean, then you are dreaming. First of all, such techniques are in the category of impact force on the use-of-force continuum, while the criminal is using deadly force, and that is totally unbalanced. Second, you still have to deal with the criminal’s survival and chase instincts. He’s not going to cooperate with your gun disarm or have the group think mentality like most martial artists. When it comes to gun disarms I play it safe with techniques that have worked for militaries worldwide: 1. 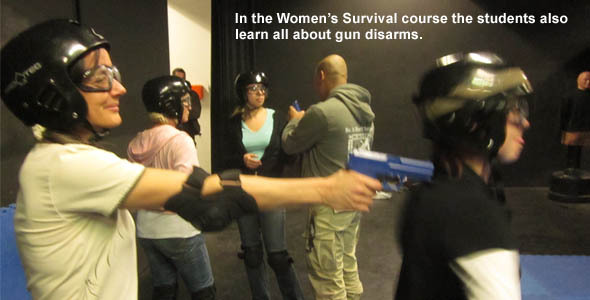 Grab the weapon with both hands staying off the centerline (to get out of the way of the bullet and muzzle blast) 2. Slam the weapon immediately into the criminal’s own face as he is still gripping the weapon to induce shock and injury 3. Strip the weapon from the suspect as hard as you can (don’t worry about finesse) 4. Counterattack or escape. In the case of gun disarms a realistic stopping point is not to return the weapon back to the suspect, as is done in so many schools and police academies. You don’t want to make the same mistake that the Finnish police officer did. Rather, a realistic stopping point is to take the gun from the suspect and begin moving back to the minimum reaction distance of 21 feet (7meters) pulling the trigger as you go if the suspect is in “hot pursuit” and you are in fear of your life or great bodily injury. If the gun fails to fire the student must be prepared to use it as an impact weapon. Like the Finnish police do now in training, the one who performs the gun disarm will then assume the role of the criminal. AT NO TIME IS THE GUN JUST HANDED BACK. It is this kind of practice that will make you perfect. 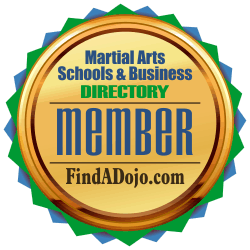 Jim Wagner Reality-Based Personal Protection on the Martial Arts Schools & Businesses Directory or FindADojo.com. 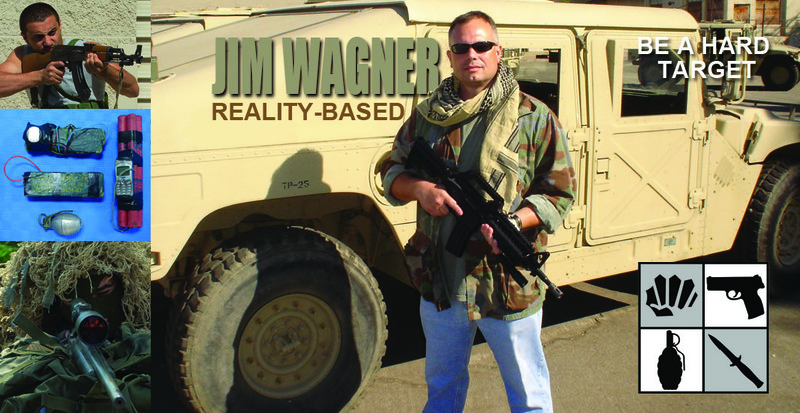 To contact Jim Wagner or Jim Wagner Reality-Based Personal Protection, visit his listing on the Martial Arts Schools & Businesses Directory of FindADojo.com by clicking on the image on the left.